Learn the joy of fixing your own bicycle with in-depth instruction in the Bike Program DIY Workspace. This six-session course will teach you to repair and maintain a standard road, mountain, or commuter bike. 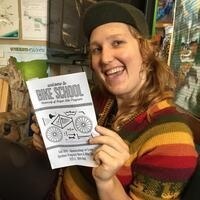 Featuring instruction from Bike Program Mechanic Sam Miller! *Outdoor Program Membership Required: Students are already members! You can purchase an annual year-to-date membership for $25. You will also need to purchase a one-time community member card from Card Services in the Erb Memorial Union for $10. The card and membership will enable you to access the Rental Barn for affordably priced outdoor gear, the Do-It-Yourself Bike Workspace, and entry to Outdoor Program events and Common Adventure trips. Questions? Email opwww@uoregon.edu or call 541-346-4365.